Dialog Enterprise, the corporate solutions arm of premier connectivity provider Dialog Axiata PLC has become the proud title sponsor of the Dialog Enterprise International Tournament. The major professional golf tournament to be held in Sri Lanka will tee off from the 5th to the 8th of December 2013 at the Royal Colombo Golf Club (RCGC). The Dialog Enterprise International Tournament has already confirmed the participation of about 100 top international professional and amateur golfers from the Asian golfing circuit who will battle it out at the RCGC. The practice rounds leading to the tournament will be worked out on the 3rd and 4th of December at the same venue. Hosting this ProAm tournament would make it possible to host the PGIT and AGIT tournaments in Colombo which would also attract top professional golfers from the European circuit. “The event reaffirms PGTI’s growing stature as a strong platform for players from the South Asian region to gain competitive experience and make their presence felt on the higher tours. We wish the players all the best and thank the sponsors, the promoters and the Royal Colombo Golf Club for supporting us in staging this event,” Padamjit Singh Sandhu further said. The Royal Colombo Golf Club, one of the most prestigious Golf clubs in the country and a true golfing challenge was established in 1880 and is the oldest golf club in Sri Lanka. The par 71 course measures 6,560 yards through a varied ‘landscape’ of fairways, trees and water bodies. Chandana Weerasinghe, MD of Pro Golf and Promoter of the first ever modified Stableford format is excited about the format and possibly on coming Sunday, a person way behind the leaders can have a great round and win the event. “It was time to make some changes to the normal stroke play format and to see this shape up the way it has should help grow the sport. I thank Dialog for seeing this new opportunity and supporting this event as always has been,” Chandana Weerasinghe, MD Pro Golf said. Earlier this year Dialog Enterprise hosted an invite only tournament which attracted diehard golfers from leading blue chip companies. “Dialog has always been associated with different types of sports. 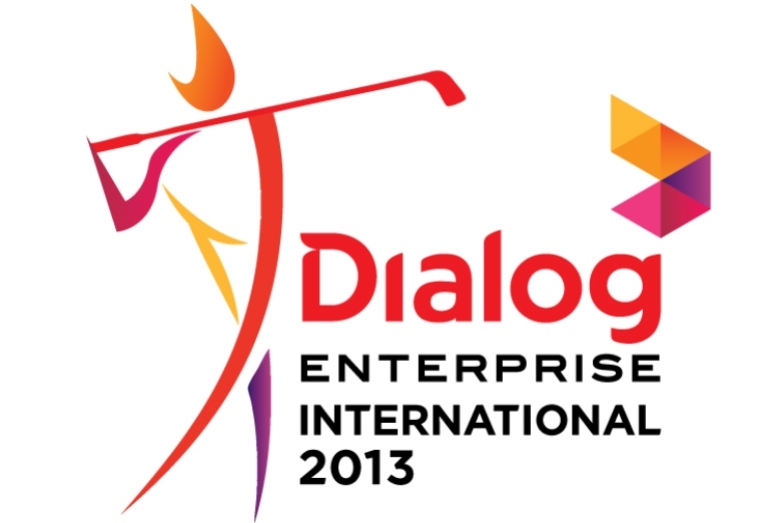 On this occasion, we are delighted to be the official patron with a classic sport like golf and be a title sponsor of the Dialog Enterprise International Tournament,” Jeremy Huxtable, Chief Officer at Dialog Enterprise said. Dialog Axiata PLC, a subsidiary of Axiata Group Berhad (Axiata), operates Sri Lanka’s largest and fastest growing mobile telecommunications network. The Company is also one of the largest listed companies on the Colombo Stock Exchange in terms of market capitalization. Dialog is also Sri Lanka’s largest Foreign Direct Investor (FDI) with investments totalling over USD 1.5 billion. Dialog has been at the forefront of innovation in the mobile industry in Sri Lanka since the late 90’s, propelling the nation’s mobile telephony infrastructure to a level of advancement on par with the developed world. The company delivers advanced mobile telephony and high speed mobile broadband services to a subscriber base in excess of 8 Million Sri Lankans, via 2.5G and 3G/3.5G and 4G networks. In April 2013, the company secured the distinction of becoming the first service provider in South Asia to launch mobile 4G FD-LTE services. The company was also the first service provider in South Asia to launch 3G services in 2006. Dialog also provides a comprehensive suite of International Roaming Services across a global footprint comprising of more than 200 countries, and operates a wide portfolio of international telecommunication services, including but not limited to retail and wholesale international voice and data services. Dialog Axiata supplements its market leading position in the Mobile Telecommunications sector with a robust footprint and market presence in Sri Lanka’s Fixed Telecommunications and Digital Television markets through its fully owned subsidiaries Dialog Broadband Networks (Private) Ltd (DBN) and Dialog Television (Private) Ltd., (DTV). DBN is Sri Lanka’s second largest Fixed Telecommunications provider. DBN serves residential and enterprise customers with voice, broadband, lease lines and customized telecommunication services. DBN has the distinction of being the first telecommunications operator in Sri Lanka to launch 4th Generation LTE High Speed Broadband Services. DBN is also a leading provider of Radio and Optical Fibre based transmission infrastructure facilities. DTV operates a Direct-to-Home (DTH) Digital Satellite TV service and is the market leader in Sri Lanka’s Pay TV sector. DTV supports a broad array of international and local content in both Standard Definition (SD) and High Definition (HD) formats alongside a wide portfolio of Sri Lankan television channels and delivers high quality infotainment to a viewer base in excess of 275,000 Sri Lankan Households. Dialog is an ISO 9001 certified company and has received numerous local and international awards including the National Quality Award, Sri Lanka Business Excellence Award, and 3 successive GSM World Awards. At the SLIM-Nielsen People’s Choice Awards 2013, Dialog was voted by Sri Lankan consumers as the Telecom Service Provider of the Year in addition to being named the Internet Service Provider of the Year.